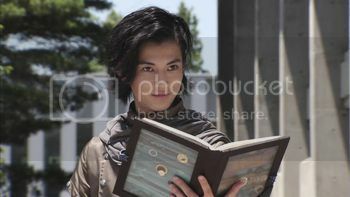 So... Kinji just attained Garo's Yami form from Gold Storm? i was kinda hoping that he would use both you-power and nintality, to mix and improve. but the fact it was his friends that saved him, and even his sensei, well, pretty cool. super star mode seemed to have white gold tights? maybe i saw it wrong? yeah the girl power episodes are nice. um ... how many female leaders were there? gekiyellow and the white kakuranger come to mind. super star did seem cheap but .... yes it worked. now if he can super star and chou zetsu ... OOOO! The dancing leaves! Midorininger! i also collect transformers! Monarch of the Sandswept Beaches! Jyuoh Tortoise! This geek life on youtube! A good follow-up to the previous episode, even if the whole Demon Sword = Powerup thing was kind of obvious. The highlight though is Kyuuemon throwing a fit; that's something we haven't seen before. midorininger wrote: i was kinda hoping that he would use both you-power and nintality, to mix and improve. but the fact it was his friends that saved him, and even his sensei, well, pretty cool. super star mode seemed to have white gold tights? maybe i saw it wrong? that's right, timepink was bossy! and im just starting dekaranger and doggyman said she was boss. Eh, Umeko (DekaPink) was never leader, she just claimed she was and the team went with it so Umeko wouldn't have a tantrum. GekiYellow was claimed as leader but the show focused so much on the trio being a triangle that I never saw it to mean much. NinjaWhite and TimePink fit the bill though, I think. We also have Lady ShinkenRed for a short time. Toei is trying, it's just the focus of the show. This would be us asking for a brother duo in Precure. It isn't going to happen. I'm not asking for them to be the focus of the show, but it sure would be nice if they were treated like full members of the team instead of the sidekicks who don't get all the cool gadgets the hero does. Lunagel wrote: I'm not asking for them to be the focus of the show, but it sure would be nice if they were treated like full members of the team instead of the sidekicks who don't get all the cool gadgets the hero does. I agree, but it's not just them. 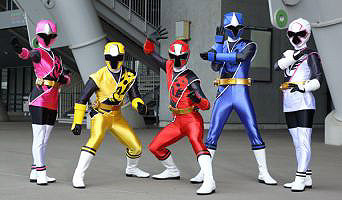 Takaharu and Kinji are the only Ninningers who get to be portrayed like main characters. The rest of them are virtually background characters most of the time. It's one of the things that really drags this show down for me. Yakumo, Nagi, and Kasumi all had decent focused episodes. With Nagi having a lot more focus for a yellow, Fuuka had two or three focused episodes in a row. I believe we are going to get a string of Kasumi focused episodes soon. It seems they've been building up a battle between Kasumi and Shitake no Hana. I think it's Ariake no Kata. I think Kasumi has had good characterization. She's clearly the smartest of the group and has solved their fuckups many a time. is it at all possible that this team doesnt have a leader? i mean, outside of star arent they are family? so perhaps, while the older step forward .... they have no defined leader. in transformers, optimus has 3 second in commands. Jazz, Ironhide, and Prowl. the autobots just follow which ever takes lead when OP is away. so in this case, whoever speaks up is likely "the leader" at that time. if you think about it, they arent organized in the least bit, this would make sense for ninninger. EDIT: P.S. am i alone in thinking gekiastsu dai-oh's feet make him look like he is wearing animal slippers?